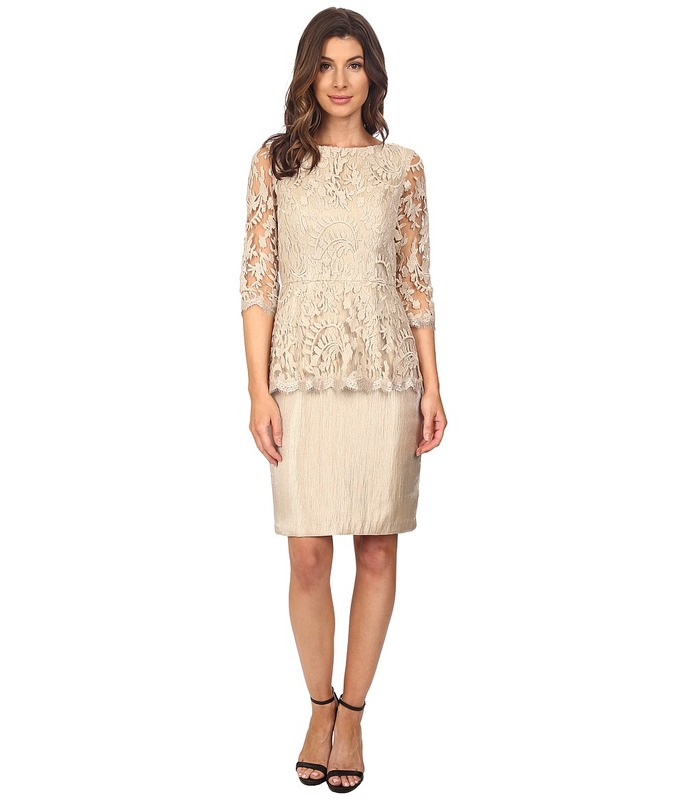 Elevate your style with this stunning Adrianna Papell dress. Gorgeous fit-and-flare dress boasts overlay with variegated horizontal stripes. Round neckline. Cap sleeves. Illusion yoke and illusion band at hem for added allure. Zip closure at back below keyhole cutout. Straight hemline. Fully lined. 96 percent polyester, 4 percent elastane Combo: 100 percent polyester Lining: 96 percent polyester, 4 percent elastane. Dry clean only. Imported. Measurements: Length: 39 in Product measurements were taken using size 2. Please note that measurements may vary by size. 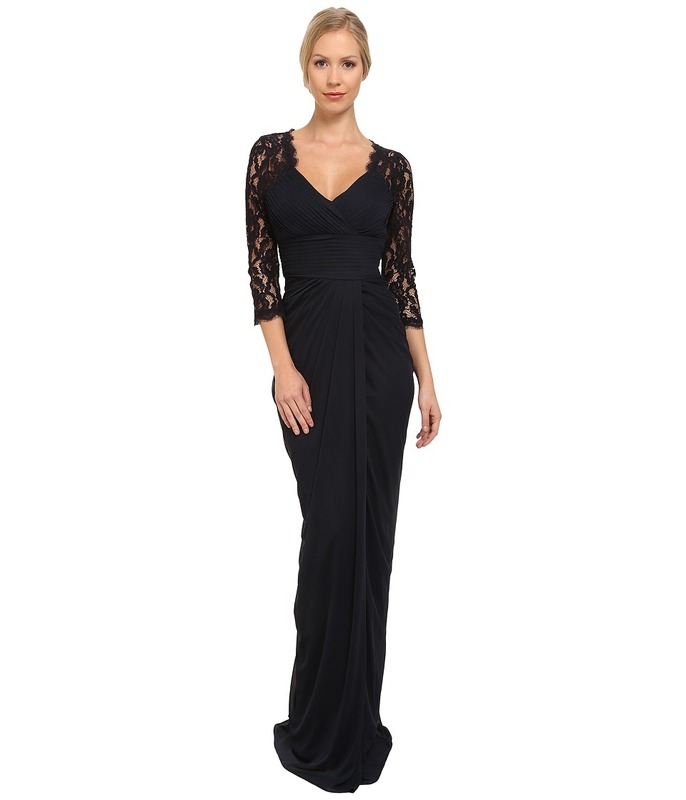 Glamour and sophistication will be yours with this stunning Adrianna Papell dress. 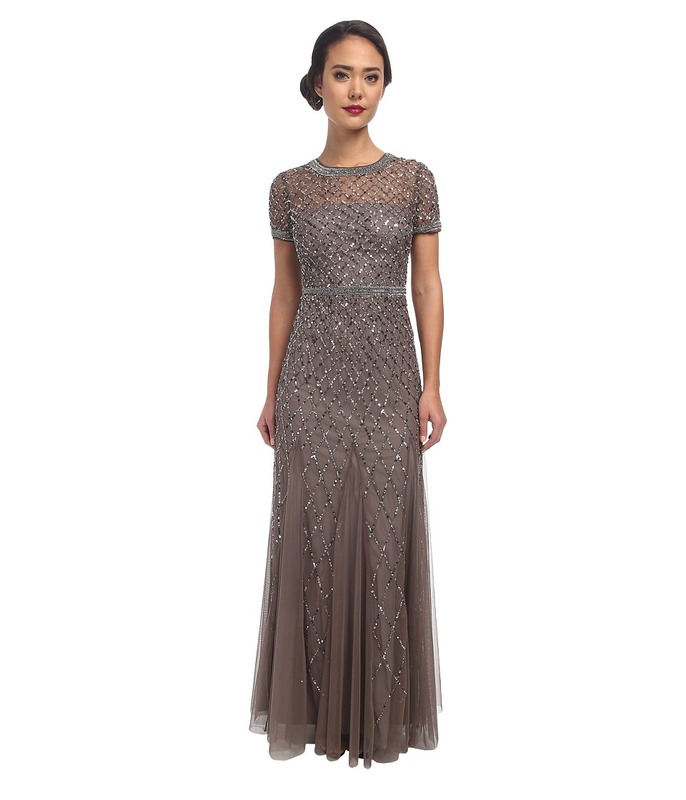 A-line evening gown features an exquisitely beaded overlay. Illusion yoke with round neckline. Cap sleeves. Fitted bodice with gently pleated skirt. Beaded inset belt at empire waist. Banded collar and cuffs feature beaded design. Keyhole cutout at back. Concealed back-zip closure. Soft cups provide light support. Floor-sweeping length. Lined. 100 percent polyester Lining: 100 percent polyester. Spot clean only. Imported. Measurements: Length: 62 in Product measurements were taken using size 6. Please note that measurements may vary by size. Add some pizzazz to your playsuit! Sleeveless jumpsuit features a beautiful open-front overlay. Knit poly fabrication in a two-tone, tuxedo design. V-neckline with a concealed zip-closure in the back. Jumpsuit legs in a capri length. Overlay has a high-low hem. 100 percent polyester Lining: 92 percent polyester, 8 percent elastane. Dry clean only. Imported. Measurements: Inseam: 20 in Product measurements were taken using size 2. Please note that measurements may vary by size. 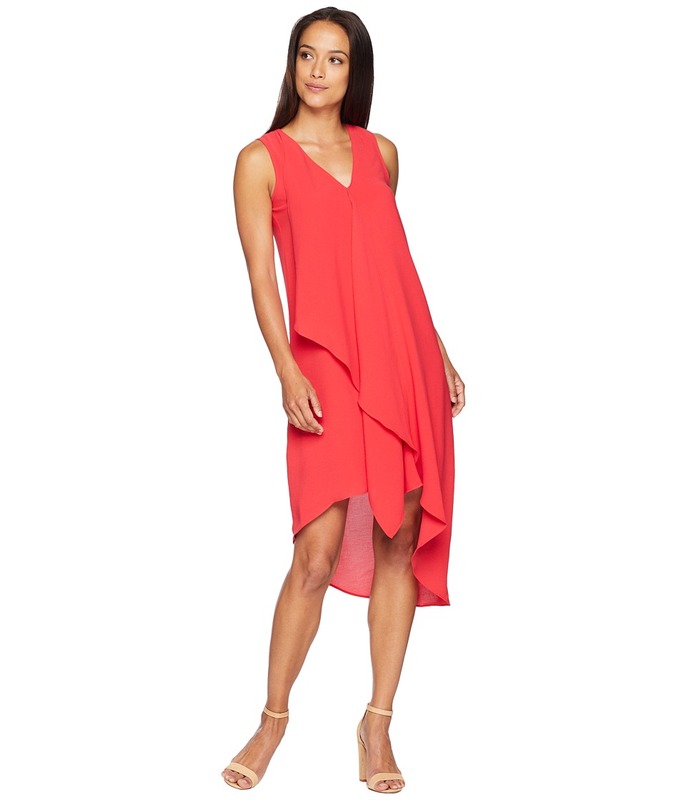 Flatter your feminine shape in the Adrianna Papell Asymmetrical Front Drape Dress. Poly crepe chiffon cascades over the body with ruffled accents. Sleeveless design with a V-neckline. Slip-on style no closure. Asymmetrical hem. Lined. Dress and lining: 100 percent polyester. Dry clean only. Imported. Measurements: Length: 46 in Product measurements were taken using size 2. Please note that measurements may vary by size. Spice up the night in this Adrianna Papell Color Blocked Overlay Jumpsuit. Sleeveless jumpsuit features a beautiful open-front overlay. Knit poly fabrication in a two-tone, tuxedo design. V-neckline with a concealed zip-closure in the back. Jumpsuit legs in a capri length. Overlay has a high-low hem. 100 percent polyester Lining: 92 percent polyester, 8 percent elastane. Dry clean only. Imported. Measurements: Inseam: 20 in Product measurements were taken using size 16W. Please note that measurements may vary by size. 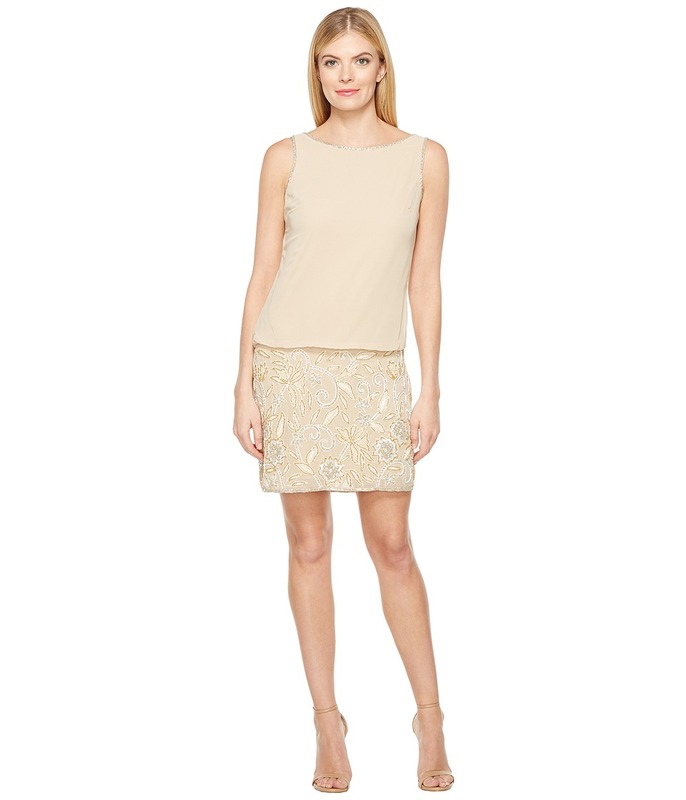 When the night has to look your best, make sure to grab for this Adrianna Papell dress. Delicate floral lace flaunts a chic peplum bodice. Boat neckline. Three-quarter sleeve design. Deep V-backline leads to a concealed back zip closure. Straight hemline with back vent. Imported. 72 percent cotton, 18 percent nylon, 10 percent polyester Combo: 71 percent viscose, 18 percent polyester, 11 percent nylon Lining: 96 percent polyester, 4 percent elastane. Fully lined. Dry clean only. Measurements: Length: 36 in Product measurements were taken using size 2. Please note that measurements may vary by size. Dazzle as you dance in this winning Adrianna Papell gown. Structured pleating encircles the mermaid silhouette. Surplice-style neckline. Concealed zip closure in the back with button top closure. Three-quarter sleeves in sheer lace with scalloped trim. Fitted waist. Floor-sweeping hem. Fully lined. Shell: 54 percent viscose, 46 percent nylon Shell 2: 100 percent polyester Combo: 100 percent nylon Lining: 100 percent polyester. Dry clean only. Imported. Measurements: Length: 62 in Product measurements were taken using size 4. Please note that measurements may vary by size. You~re the belle of the ball in this Adrianna Papell Beaded Bodice Tulle Gown. Fitted bodice is beautifully beaded for a gorgeous look. V-neckline. Thin spaghetti straps for a sleeveless flair. Hidden zipper pocket at back. Flowing tulle skirt is lightweight and adds an angelic movement to your look. Ankle-length hemline. Molded cups for a smooth and supportive fit. Partially lined. 100 percent polyester. Spot clean only. Imported. Measurements: Length: 61 in Product measurements were taken using size 2. Please note that measurements may vary by size. Fit-and-flare cocktail dress flaunts a flared taffeta skirt with side hand pockets. Sleek fitted bodice with scoop bateau neckline. Back-V shows just a touch of skin. Three-quarter length sleeves accented with gathered cutouts adorned with sparkling rhinestones. Belt loop waist accented with an oversized tie belt for a charming finish. Back zipper closure with hook-and-eye closure. Lined. Shell: 95 percent polyester, 5 percent elastane Skirt: 100 percent polyester Lining: 100 percent polyester. Dry clean only. Imported. Measurements: Length: 37 in Product measurements were taken using size 4. Please note that measurements may vary by size. 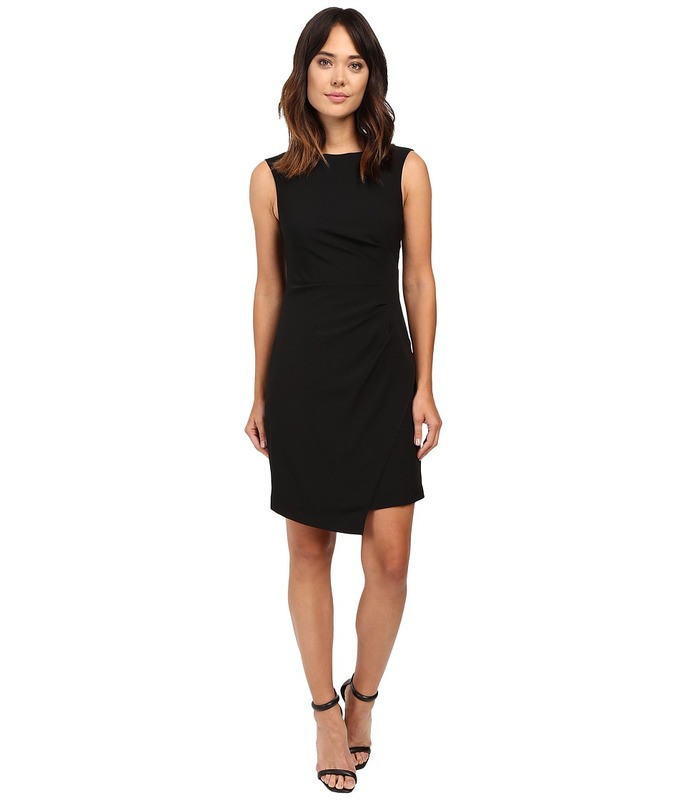 Slimming sheath dress flaunts a ruched design at waist. Stretch crepe for an elegant finish. Cowl neckline. Pleated short sleeves. Straight hemline hits at the knee. Vented back. Back hook and zipper closure. Fully lined. 97 percent polyester, 3 percent elastane Lining: 96 percent polyester, 4 percent elastane. Dry clean only. Imported. Measurements: Length: 41 in Product measurements were taken using size 2. Please note that measurements may vary by size. 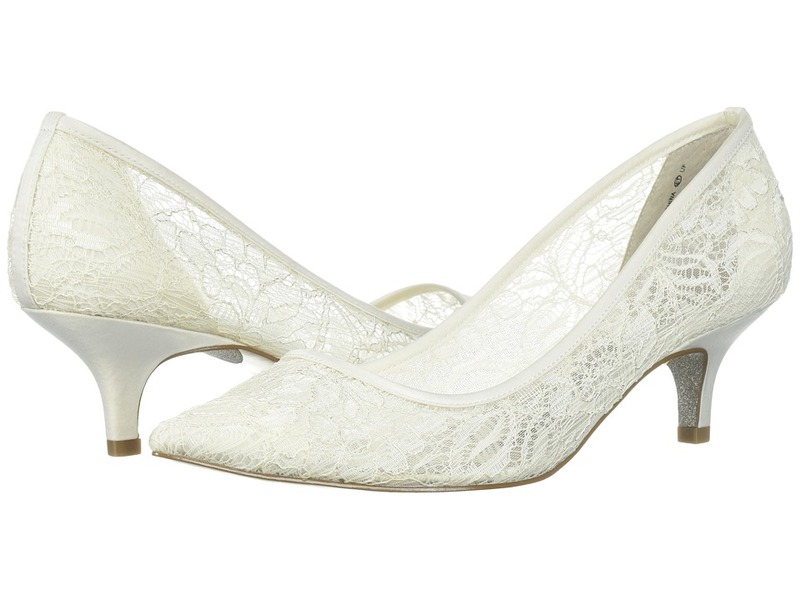 You~ll feel stunning in the elegant design of the Lois Lace pump. Mesh upper features lace overlay. Slip-on construction. Pointed toe silhouette. Synthetic lining. Lightly cushioned leather footbed. Wrapped heel. Synthetic outsole. Imported. Measurements: Heel Height: 2 in Weight: 6 oz Product measurements were taken using size 8, width M. Please note that measurements may vary by size. Weight of footwear is based on a single item, not a pair. Create an unforgettable look with the Adrianna Papell Daisy sandal. Leather upper features rhinestone and chain medallions. Slingback strap with adjustable buckle closure. Clear band adorns open toe. Man-made lining and footbed. Wrapped block heel. Man-made sole. Imported. Measurements: Heel Height: 1 1 4 in Weight: 10 oz Product measurements were taken using size 8, width M. Please note that measurements may vary by size. Weight of footwear is based on a single item, not a pair. Lightweight, crepe chiffon dress is elevated to new style heights with a cascading drape detail. Cold-shoulder detail highlights the short flutter sleeves. Plunging V-neckline accentuates the decolletage. Straight hemline hits at the knee. Pullover design. Lined. 100 percent polyester Lining: 100 percent polyester. Machine wash cold. Imported. Measurements: Length: 36 in Product measurements were taken using size 2. Please note that measurements may vary by size. 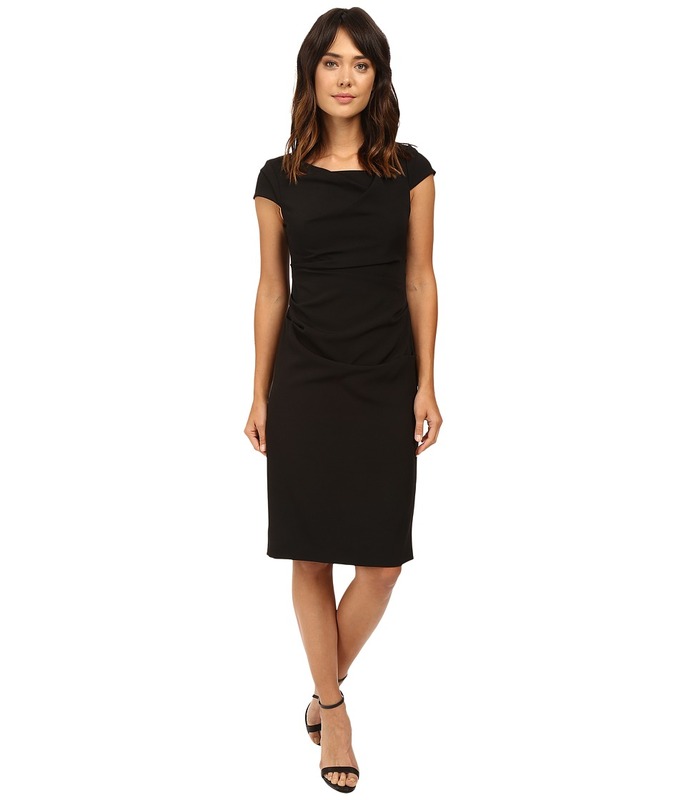 Slimming sheath dress flaunts a ruched design at waist. Stretch crepe for an elegant finish. Jewel neckline. Sleeveless design. Back hook and zipper closure. Fully lined. Wrap inspired straight hem. 97 percent polyester, 3 percent elastane Lining: 96 percent polyester, 4 percent elastane. Dry clean only. Imported. Measurements: Length: 35 in Product measurements were taken using size 2. Please note that measurements may vary by size. You~re a showstopper in this gorgeous Adrianna Papell Sleeveless Dress! Striped lace shift dress. Round neckline. Sleeveless construction. Exposed zipper closure at back. Lined. Straight hemline. Shell 1: 100 percent nylon Shell 2: 100 percent polyester Shell 3: 100 percent polyester Lining: 100 percent polyester. Dry clean only. Imported. Measurements: Length: 34 1 2 in Product measurements were taken using size 2. Please note that measurements may vary by size. Sophisticated chic! Floral beading adorn skirt and edges for a surprising feminine touch. Solid, blouson top gently drapes over body. High neckline drops at back for a bold and eye-catching appeal. Sleeveless design. Easy, slip-on design. Lined. Straight hemline falls above the knee for a flirtatious appeal. Shell lining: 100 percent polyester. Spot clean only. Imported. Measurements: Length: 34 in Product measurements were taken using size 2. Please note that measurements may vary by size. Accentuate your fun personality with these glam sandals from Adrianna Papell. Satin fabric upper. Elastic slingback strap. Open toe with asymmetrical ruffled strap. Textile lining. Lightly padded footbed. Wrapped heel. Man-made sole. Imported. Measurements: Heel Height: 4 in Weight: 7 oz Product measurements were taken using size 8, width M. Please note that measurements may vary by size. Weight of footwear is based on a single item, not a pair. 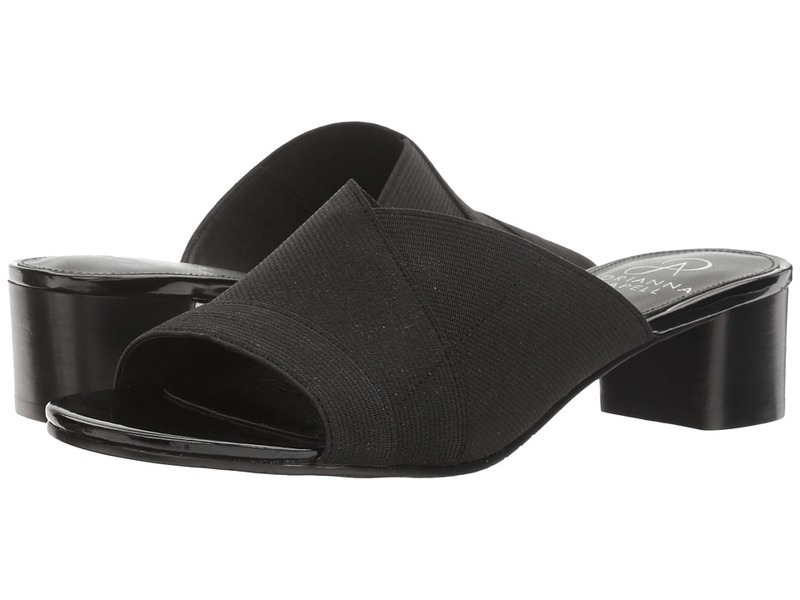 Feel like royalty in these stylish Adrianna Papell slip-on sandals. Fabric upper. Slip-on wear. Open toe. Smooth leather linings. Stacked block heel. Leather sole. Imported. Measurements: Heel Height: 1 3 4 in Weight: 7 oz Product measurements were taken using size 8, width M. Please note that measurements may vary by size. Weight of footwear is based on a single item, not a pair.